The Peugeot 205 GTI is a high performance car from Peugeot. The model of the car is directly derived from the 1980 model of the hatchback. There are several qualities in the car that makes it special for a driver and reasons for its popularity. It has a precise handling and it is supple to ride that the driver and the passengers feel comfortably instantly. The engines are known to be tough, very reliable and what comes as a surprise is the fuel economy of the car. This is a much desired quality from a high performance car. The looks of the car appeals to several people so it is a fine combination of all the qualities and you can call it a jack of all trades. As a result the Peugeot 205 GTI has attained a godly status among the hatches and it is still very much in demand in the current day car market. There are several good points one can consider ion the Peugeot 205 GTI like the power of the car which speaks for itself through the drive train. The looks of the car are deadly and makes the owner proud. The best thing about owning such a car is that the parts of the car are easily available making it the easiest specialized cars to own. The reason why the parts are available is because of the demand. When there is a demand for a certain car the car parts also become easily available. Owners of the car find it low maintenance and that goes all the way for a high performance car. Also any one can fix the car on their own for most of the trivial issues and so it gives the ease of use like just any other normal car. However the performance is much higher than a normal car. 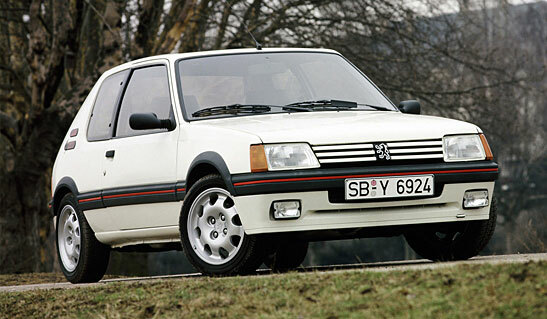 The Peugeot 205 GTI is one of the hottest hatches available with a 1.6 Liter engine and a single camshaft of 115 bhp. The reason for the car’s popularity is its classic Pinnifarina style that makes it a hot Italian car. When you look at the car you can easily identify the distinctive C pillars and the front grilles. From a design point of view one has to look really hard to find flaws with the vehicle. The engine and the chassis are very impressive however the only set back is that they lack the innovative technology available today. However they do not lack anything other than that when compared to most modern cars in terms of handling, and responsiveness. Users also find the revving high at low speeds in the car and this is probably because of the engine specifications. The Peugeot 205 GTI also came with a variant with a 1.9 Liter engine. The beauty of the car is the car allows the driver to harness its power and encourages pushing the upper limit. Over all the Peugeot 205 GTI is an economic car that can be easily maintained and also lets the user enjoy high performance.